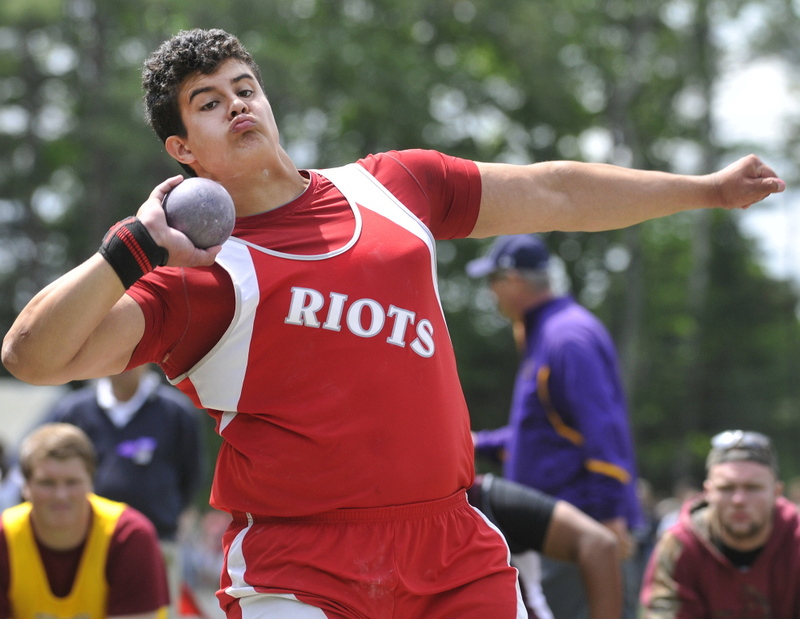 Dan Guiliani’s goal coming into this school year was to throw the shot put more than 70 feet. The South Portland High senior said a season-ending injury is not going to stop him. Guiliani got word Monday he will need an MRI later this week to determine if the injury to his right elbow is a torn ulnar collateral ligament. He suffered the injury while throwing the shot put 58 feet, 6.75 inches at his first indoor meet Dec. 12. The injury was initally diagnosed as tendinitis, or “golfer’s elbow,” and Guiliani was told to rest for several weeks. After little improvement, Guiliani sought out Chris Pribish, the sports trainer and physical therapist who has worked with the national champion long jumper, Kate Hall. Guiliani said Pribish, who could not be reached for comment, recommended the MRI, scheduled for Friday. Guiliani remains hopeful he can get healthy and have a shot at placing at the New Balance outdoor national championships in June. He will be sidelined for the rest of the indoor season. On Nov. 12, Guiliani signed a letter of intent to compete at Iowa State on a full scholarship. Guiliani finished the outdoor season last year ranked sixth in the nation after throwing 66-5 on May 19. He then won the Class A state meet with a state-record throw of 62-8.25 and finished first at the New England championships (64-2.25). He opted to attend a national throwing camp instead of competing at the nationals. “Definitely what we’re looking for is trying to medal at nationals. I know I can. It won’t happen if I rush back and do permanent damage,” he said. TEAMS IN THE Kennebec Valley Athletic Conference have a limit on how many athletes they can enter in an event because of a new rule – and some coaches call it a distinct disadvantage this indoor season. Bowdoin College, where the KVAC teams hold their meets, had to restrict the length of meets to five hours, said Mt. Ararat Coach Diane Fournier. As a result, the KVAC indoor track league rules committee decided to limit the number of participants in each event. Lynn Ruddy, the Bowdoin associate athletic director, did not return calls to comment. But Fournier said league athletic directors made the decision to limit the number of participants using new guidelines: six entries per school in the sprints and hurdles, four entries for the distance events and four entries for all field events except the shot put, which will be allowed six. Meanwhile, in the Eastern Maine Indoor Track League and the Penobscot Valley Conference, teams aren’t limited in the number of athletes entered in an event, although sometimes other restrictions must be faced, said he league director, Mary Cady. In 2012, both leagues were restricted to two mini-meets at the University of Maine field house because of university events taking place on the same day. Cady said among other changes, the league only allowed athletes to compete in two rather than three events. “I understand KVAC coaches are upset, but when we have to use college facilities for high school meets, we have to abide by their rules,” Cady said. SEVERAL ATHLETES turned in performances last weekend at the Dartmouth Relays in Hanover, New Hampshire, that would have been good enough for victories in last year’s Class A indoor state meet. Defending state champion Samantha Curran of Thornton Academy finished third in the shot put with a distance of 38 feet, 51/4 inches, the leading throw in Class A this season and better than her winning throw of 38-0.75 last year. Scarborough senior Griffin Madden finished second in the 55-meter hurdles with a state-leading time of 7.77 seconds, better than the 7.78 that won the event at the Class A meet. And defending Class A pole vault champion Peter Hegarty of Sanford finished third with a vault of 14-0, better than his state-winning 13-6. Finally, Orono junior Tia Tardy finished fourth in the seeded heat of the mile in a time (5:05.55) that would have won last year’s Class A title (5:20.35). Orono competes in Class B; the winning time in that state meet last winter was 5:38.47.